Affiliated with the 26th NC Regiment and providing dedicated artillery support is the 1st North Carolina Artillery - Battery D (Reilly's Battery). Reilly's battery, which also portrays the 5th US Artillery, is one of only a few horse-drawn artillery organizations in the country and one of a very, very few that can field two horse-drawn guns at the same time. Of the approximately 300 or so artillery pieces in the nation, only 30 are horse drawn, and only 15 of those use the period correct horses. 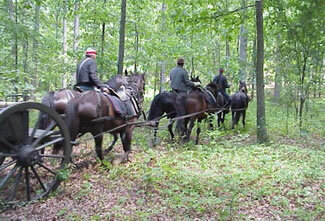 Reilly's Battery is the only horse-drawn section of guns on the East Coast. Reilly's Battery fields two 10-pounder Parrot rifles and one 6-pounder smoothbore cannon with two horse-drawn teams. 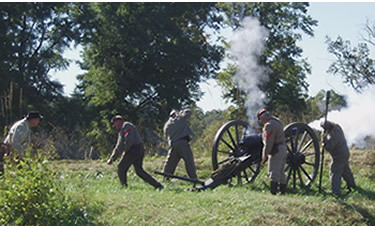 The unit prides itself in its ability to utilize artillery on the field as is was actually done. 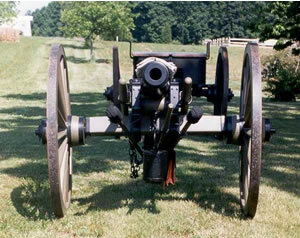 By its ties with the 26th NC Regiment, Reilly's Battery has fulfilled the goal of providing true artillery support from highly mobile horse-drawn guns. Often these evolutions allow for the unit to called for by the advancing infantry, to move forward just behind the advancing lines, unlimber and fire within minutes. By the same token the unit can maneuver with the knowledge of committed infantry support from the infantry within the 26th NC . Few units function this way within the hobby.